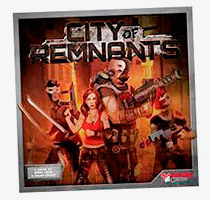 Disclaimer: Plaid Hat Games kindly provided me with a review copy of City of Remnants. I must have been the only boardgamer on the planet that never got that excited about Summoner Wars. I admit this is largely my own fault, as I haven’t played it enough and got to know the particular strengths and weaknesses of the different factions. It’s not really a game you can pick up and play without knowing the decks. If you do, you often end up in a protracted game with a few units at the end chasing the Summoner around the board for an eventual win, and you miss out on the strategy and depth of the game. What I did admire from the start, however, was the way Colby Dauch of Plaid Hat Games established his company. He started with a low cost, easy to produce game in a couple of small boxes, weathering a bit of criticism directed at the cheap paper mat inside. But then, when people realised the game was great and started playing it and buying it, he released more decks that worked beautifully together and expanded the game, a separate deluxe board for those who wanted a ‘proper’ board, and eventually a Master Set with 6 new factions and the board in one big box. In other words, he started conservatively and, as the game became successful, ramped up the ambitiousness of the releases. It was a very clever way of establishing Plaid Hat Games, and since then the company has gone from strength to strength and released some great games. Which is satisfying because from the interviews, he comes across as a damn nice guy who loves boardgames. Mice & Mystics has been a big hit, Dungeon Run is a respectable dungeonbash from what I’ve heard, and on the horizon is Bioshock Infinite, the offical boardgame of the smash hit computer game. And this year also saw the release of something quite ambitious and different: a game called City of Remnants. Colby seems to be very proud of this game, and slightly disappointed at its reception, and you can understand why he feels both emotions. It is a fantastic game, but I think it’s going to be a slow burning hit rather than a sudden and short success. This is a game that slowly reveals itself as brilliant—it’s not obvious and showy, and it straddles a strange middle game between Ameritrash and Euro by mixing together things like bidding and dice rolling, area control and special item cards. It’s a game that can’t be summed up in a single, pithy description as a result. I won’t go into the rules too much, but suffice it to say that players are gang leaders on an alien planet, where slave races have been dumped together in a city run by the dominating Yugai race (Yugai? Sounds like a yogurt, not your evil alien overlords…) There’s a Judge Dredd, Mega City One vibe to the whole affair but it’s a refreshingly original theme that possibly also draws inspiration from the old 80s film The Warriors. You need to balance a fascinating selection of different actions and mechanics to achieve eventual dominance: bidding for gang members and buying items on the black market to develop a deck of cards in a deckbuilding fashion; buying developments on the board to produce and sell product (it doesn’t get specific, but it’s gotta be guns and drugs, let’s face it), placing gang members on the board to control different areas of the city, and good old fashioned dice rolling to fight Yugai patrols and beat the other gangs and take over their territory. There seems to be a lot going on here, but in fact my rules summary can distil it down to a single page of rules, and after a long game or two to get the hang of how it all works, you’ll be neck-deep balancing these different actions to win. One of the satisfying things about the game is how the different mechanics, none of which are particularly original, hang together so beautifully to make something that is in the end utterly original—and without needless bolted-on special rules and exceptions. City of Remnants is a well-designed, multi-layered, involving experience that really has something for everyone, unless of course you’re one of those dice haters, and if so, what are you doing on this site? From a playability standpoint the design is excellent. Personally I find the board somewhat lacking excitement; like a Google Earth view of a city suburb rather than a teeming, rundown alien metropolis. The development tiles have much more character and I wish the board had been done in the same illustrated style. It’s a bit confusing that the three precincts use the same red, blue and green as three of the player colours. The box cover is quite dark and desaturated, an effect increased by a matt varnish, and I think the logo could have jumped out more. However the information design is very effective: the way the developments share geometric symbols with their matching cards is very clear, and the cards are suitably gritty and scifi in feel, with characterful art. There are a lot of components to lay out on the table at once, which makes the first games a bit difficult as everyone is reading and checking cards and tiles, but this improves with further plays as you recognise them. These small quibbles don’t detract from what is a well-designed, multi-layered, involving experience that really has something for everyone, unless of course you’re one of those dice haters, and if so, what are you doing on this site? Deck builders will love the way you can maximise the effectiveness of your hand of gang members and special items, but you’ll have to plan your agressive moves carefully because combat can be deadly and you can permanently lose important gang members. Others will love the thematic aspects of the game, the disinctive play styles of the gangs, the wealth of special black market items, the deadly card-and-dice combat, the random nature of the Yugai patrols … well, you get the picture. This is a game that’s going to be played and enjoyed for a long time, even if it didn’t quite hit the market with the bang that Plaid Hat anticipated. It will will probably fall into the background even more with the imminent release of Bioshock Infinite. But it’s definitely a keeper, and proving again that Plaid Hat Games is doing some exciting things mixing interesting themes with involving mechanics. I couldn’t finish reading this review. The photo viewer keeps changing the size of the page, which makes all of the text on the page jump. Thanks! For some reason, I just can’t get excited about this game (which is probably why it is not jumping off the shelf). The cover art does not help at all. This one was on my radar, and kinda just stayed there. I suspect the problem is the abundance of really great games hitting my gaming table of late making it hard to actually put cash down for something like this. After reading your review – Time to get the lead out and just order the darn thing.